A serial killer who knifed four people to death within three days has been found dead at Broadmoor Hospital. Daniel Gonzalez, 26, was given six life sentences for the murder of two men and two women in Sussex and north London. 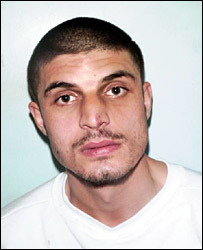 Gonzalez, of Woking, Surrey, carried out the random attacks over three days in September 2004. He also attempted to knife two other men to death. A Broadmoor Hospital spokesman said he was found dead at 0830 BST on Thursday. A police investigation is under way. "Police attended the hospital to investigate, as is normal procedure when there is a death in custody," the spokesman said. "We will not comment further until a post mortem examination has been carried out." Gonzalez was considered one of the most dangerous patients at the maximum security hospital. He told police he had wondered what it would be like to be Freddy Krueger, from the Nightmare on Elm Street horror films, for a day. 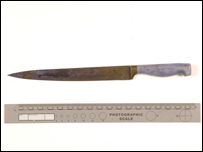 Jurors at the Old Bailey decided he killed in cold blood and was not suffering from a mental illness, as he claimed. They took just 90 minutes to convict him. Defence witness Dr Edward Petch, a psychiatric consultant at Broadmoor Hospital, said during the trial that he was a schizophrenic capable of "extreme, unprovoked and unpremeditated violence". His victims were Derek Robinson, 76, and his wife Jean, 68, from Highgate, north London, Kevin Molloy, 46, who was killed in Tottenham, north London, and Marie Harding, 73, who was murdered near Worthing in Sussex. The men who survived his attacks were Peter King, 61, who was attacked in Portsmouth, Hampshire, and Koumis Constantinou, 59, who was knifed in north London.